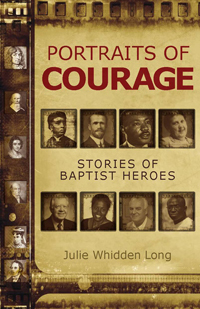 Portraits of Courage is the story of fourteen Baptist heroes and is written for first-time readers of Baptist History and for Youth. As such, it is the only book of its kind. Long writes with lively prose about a select group of individuals who led outstanding Christian lives while serving as Baptists. Heroes in this book include John Smyth, John Clarke, Ann Hasseltine Judson, Jesse Mercer, Lottie Moon, William Knibb, Louise (Lulu) Fleming, Walter Rauschenbusch, Martin Luther King, Jr., Addie Davis, Jimmy Carter, Leena Lavanya, Theo Angelov, and Olu Menjay. While some names are more familiar than others, each has left an enduring legacy. Special features of the book: —A timeline of events covering 400 years of Baptist life in several countries —An introduction that defines a Baptist hero —Dozens of illustrations and sidebars for terminology and other additional information This book is written with youth in mind, but any who spend time with it will learn much about those who made a difference in the world while serving God through Baptist life.